Nadine and I first met last year as mentees of the 2013 Maurice Saxby Mentorship. We had a ball together and are now firm writing buddies. 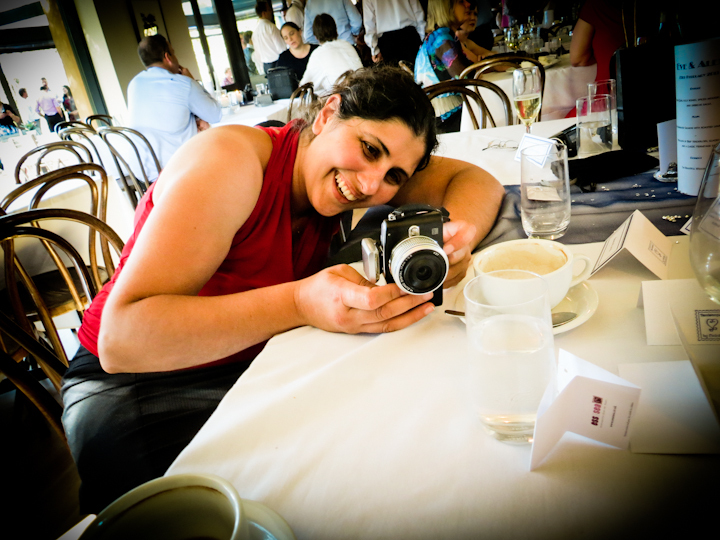 Nadine is a versatile and talented author, writing picture books, middle fiction and Junior Fiction through to YA and her current, awesome project: a hybrid Graphic Novel. She has been widely published in the Herald Sun, Magpies Magazine, Comet Magazine, Alphabet Soup and Ladybug Magazine in the U.S. Nadine’s work is clever and funny and sometimes downright scary! She also lectures in Children’s and Adult Writing at the University of Ballarat. When Nadine’s not writing, she’s often seen out and about with her trusty camera, gathering stories in a different way. She takes the most beautiful and intriguing images. She didn’t take this one below though, her friend Ambrose took it while she was taking a picture through a water glass. I told you she was creative! Thanks for coming on to my blog today, Nadine. How are things in sunny Ballarat? Beautiful today! A little chilly, but I’m never complaining about the cold again after this blazing summer. I agree, it was far too hot. I grew up in a house full of books, and my Mum was an English teacher, so I guess I’ve always been making up stories and dreaming about seeing them in print. I entered my first writing competition when I was five and scored runner up. I still have the prize (but not the story). It was good though, lots of small animals, mess and all kinds of trouble! Do you have a writing background? I got a bit sidetracked after leaving school. I applied for a journalism course but spent too long on the question about why I wanted to be a journalist and didn’t leave time to do the test! My second choice was Engineering (I was a big fan of McGyver) so I went with that. After uni I joined the Navy and did lots of other exciting things involving sailing and mountains before settling down to have a family. That’s when I decided to buckle down and make writing my career. 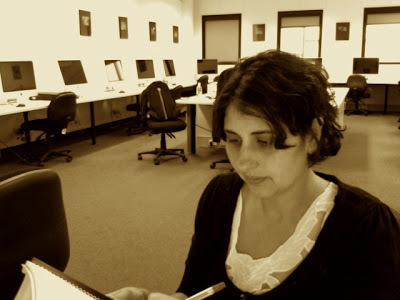 I enrolled in the Professional Writing and Editing course at RMIT and haven’t looked back. Could you tell us about some of your publications? It’s funny, but although I’ve always written and entered competitions, I only really thought about sending my work out to publishers when I started studying at RMIT. The first thing I sent out was a short story about dating (which was a bit of an anti-romance, really) and it was published online for the princely sum of $45. I’ve also had a couple of short stories for kids published in Alphabet Soup and Comet magazines and articles in the Herald Sun, Magpies and Victorian Writer. I’m also very excited to have a poem and short story in the new Charms trilogy which is a joint venture project pulled together by the lovely Sally Odgers. 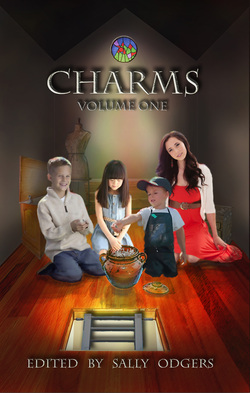 Charms draws together work by many writers into a three part fantasy novel about a magical story-telling crock that a group of five children discover in a house their parents are trying to turn into a boutique hotel. The best part is that each book in the trilogy is aimed at a different age groups: the first is for lower to middle primary, the second middle to upper primary, and the third young teens (it’s a bit darker). That’s a good question… I daydream whenever I can (and sometimes when I shouldn’t, like when I should be making tea, or working) and things kind of mush together in my brain and make interesting questions. Like ‘what if a barbeque was REALLY carried away by flies’ or ‘what happened to poor Puff the magic dragon after Jackie Paper grew up?’. I think we all have amazing ideas, and the trick is catching them and turning them into stories before they escape. I always carry a notebook. Me too. It’s a good idea. 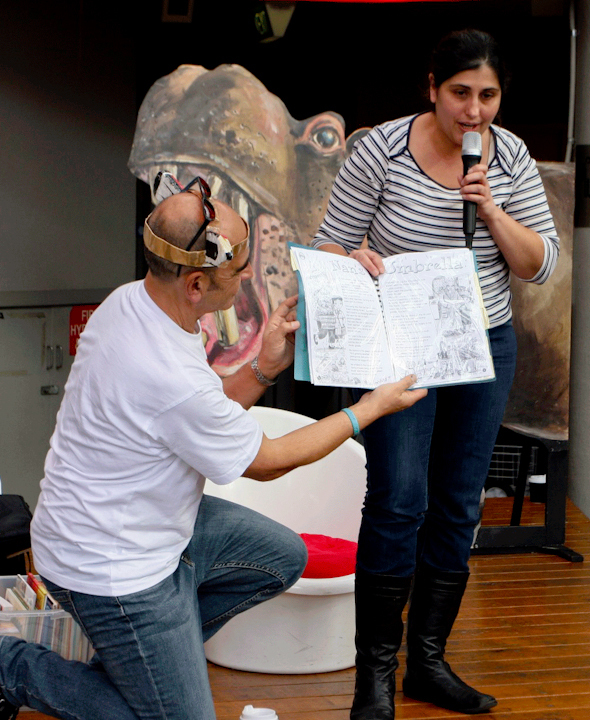 Nadine storytelling at Literature Alive last year as part of the Maurice Saxby Mentorship. That’s Kevin Burgemeestre holding her story up. Good on you Kev! When and where are you most inspired to write? Not enough! It’s really hard to find the time between kids and all the other distractions in my life. I find I get really inspired after being around other writers and talking about their stories and ideas, so I try to get out to book launches and festivals when I can. As to where – somewhere far away from my very distracting house, and near a window. Don’t ask me why! I’ve been working on a project that is part graphic novel, part novel, and part carwash with all the trimmings (that last bit isn’t true). I’ve been at it for a few years (in between poetry and picture book manuscripts) and have just finished a very rough first draft, which is exciting. I’m calling it a hybrid graphic novel, because that sounds cool. It’s called ‘Dark Room: Do Not Enter’, and is the story of 15-year-old artist Matti Maguire, who goes to her mother’s abandoned photographic dark room to draw and remember. When she realises remembering isn’t enough, she sets out to solve the mystery of the accident that sent her mother to a nursing home nine years ago. If that sounds too deep, it also has a Star Wars re-enactment involving paper planes and a dance inspired by Cocoa Pops. And a really enigmatic black cat. I’m not illustrating (although I may do some photo collage for part of it), so the graphic bits are written like film scripts. It sounds thoroughly original and unique. Congratulations. What is it about the graphic novel genre that fascinates you so much? Unlike film, you can include things that would be extremely expensive or impractical to shoot, you can ponder over the frames and pick up the fine detail, and you can carry them on the train with you and flick through their pages (and go back to check the things you’ve missed). I love the breadth of graphic novels coming from Australian creators – from the very personal and Melbourne-centred work of Mandy Orr, to Shaun Tan’s amazing The Arrival. They can take years to create, and I guess that’s why I’m looking at a hybrid format. To make things easier for my illustrator! Do you think that Graphic Novels are a medium in which ‘darker’ stories can be told? That’s a really interesting question. I guess you can tell dark stories in any medium, but (thinking on my feet here) I guess the pictorial story-telling in graphic novels can allow you to imply darker elements of a story without explicitly stating them and let the reader’s imagination enhance the mood. Or you can represent darker themes in a way that is visually easier for readers to deal with. The famous graphic novel Maus by Art Spiegelman is a good example of this: Jews are mice and Nazis are cats. I’m not sure if that was his intention, but I found the grim subject matter easier to deal with because the victims were not human. It was also handy for working out who was who. 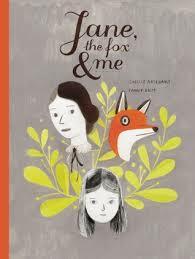 I also loved ‘Jane, the Fox and Me’ written by Fanny Britt and illustrated by Isabel Arsenault . I’m a tragic Jane Eyre fan. This story revolves around a school bullying incident; it’s refreshingly wonderful. What was your 2013 Maurice Saxby Mentorship experience like? Unforgettable. I’d highly recommend it to anyone who is trying to get a foothold in the kids or young adult writing industry. Or looking for some inspiration and a reality check! (I’m sure you would too). When I got the email letting me know I had been accepted, I had to read it a few times before it sank in. I’d followed Jackie Hosking’s mentorship through her blog and was really excited (and honoured) to be selected. It came at a time when I was a bit despondent about my chances of making it in such a competitive industry, but spending time with the wonderful creators involved (Elizabeth Honey, Kevin Burgemeestre and Mark Wilson) and watching them in action made me realise that enjoying the process of writing and sharing your work was really important, and something I had control over. So I’m focusing on that! I also met the lovely Helen Chamberlin, ‘the best children’s book publisher in Australia’ and have really enjoyed her support and words of wisdom (which she gives so generously). Yep, Helen is an amazing person. The most important thing I got out of the experience was my fellow mentees (including you!) who have been amazing new writing friends. Slaving over a hot computer can be lonely sometimes. You can check Nadine out at her website and follow her blog too.